Although he called himself The Unknown Chief for this article, when I met him his name was Roo Man! And what’s most interesting is his wife’s name which is Mrs. Roo! I asked Roo Man if he would be so kind to let us interview him. He said he’d be honored to do it, but under one condition. The condition was that Mrs. Roo had to be a part of this because they work as one. Of course we were two thumbs up for his request. His name has something to do with where he’s from. When I inquired about the interesting name, Roo Man replied, “Simple Mate! Roo from Kangaroo and Man because that’s what I think I am! 🙂 I’m kind of guessing Australia. What about you? We couldn’t help but to be drawn to the aesthetics of the dishes Roo Man and Mrs. Roo produced and their friendly personalities. You will love the food presentation and the answers of our 8 Questions with The Unknown Chief, Mr. and Mrs. Roo Man! What makes your dishes special to you? ROOMAN: When I cook, it comes from the heart, many times I spend hours finding the right meal to cook and it most times has to be something I have never made before. I try to teach my kids that food is made at home and dad can come up with more than just warming up frozen meals from the supermarket. MRS ROO: What’s special is that we like to involve the whole family in deciding what would be nice to try and experiment with different flavours and ingredients. There are also certain dishes that are family favourites (pleases everyone’s tastes) that are special and unique to our kids who will always have these particular dishes to “call home”and can take them into their adult lives. I’m sure there are many of us out there that miss their own home style favourites while growing up at home and try to replicate them in some way for their own families. 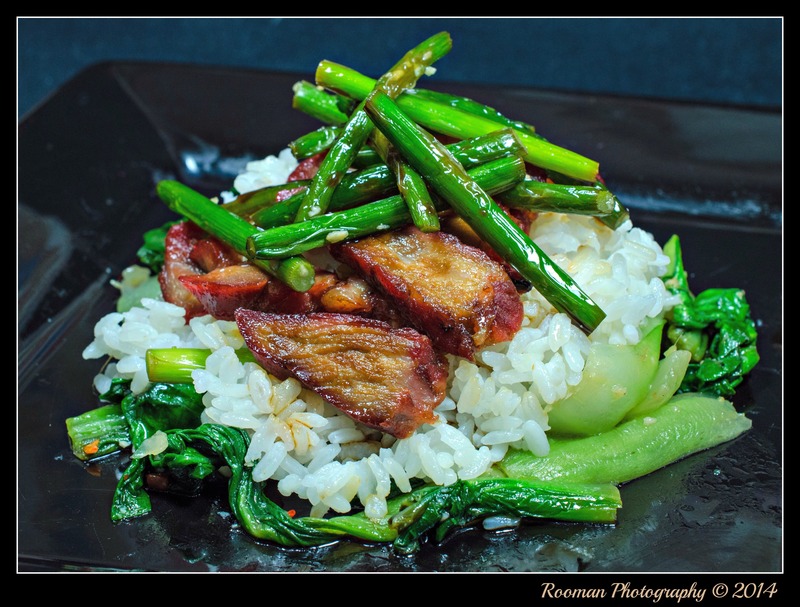 We love the bright color of the vegetables of this Char Siu Stir Fry! When did you first stumble upon your love for food and for cooking? ROOMAN: As a kid growing up in an Italian home, food was always cooked on the day and at home with us all gathered around the table talking about our day. This made me realise that food is not only about eating but also about the moment and who you spend it with. About 2 years ago my wife became very sick and spent 6 weeks in hospital. I had to look after my three kids all on my own. I wanted my kids to eat good food and not waste money on fast food. At this stage all I could make was Chicken soup and Pasta sauce. My kids do not like pasta sauce much so I had to learn very fast how to cook. I started with a stir fry which I always thought was hard. My wife being Asian cooked many Asian meals, so lucky I would once in a while watch and ask questions. I would cook for the kids and then sneak the food into the hospital for my wife. Unfortunately for us my wife ended up in hospital 3 times in 18 months, but on the other hand, my wife was a little less stressed knowing the kids would all be fed good food. So cooking good food from the heart has taught me that it can make others feel good for that ‘one moment’ in their life. 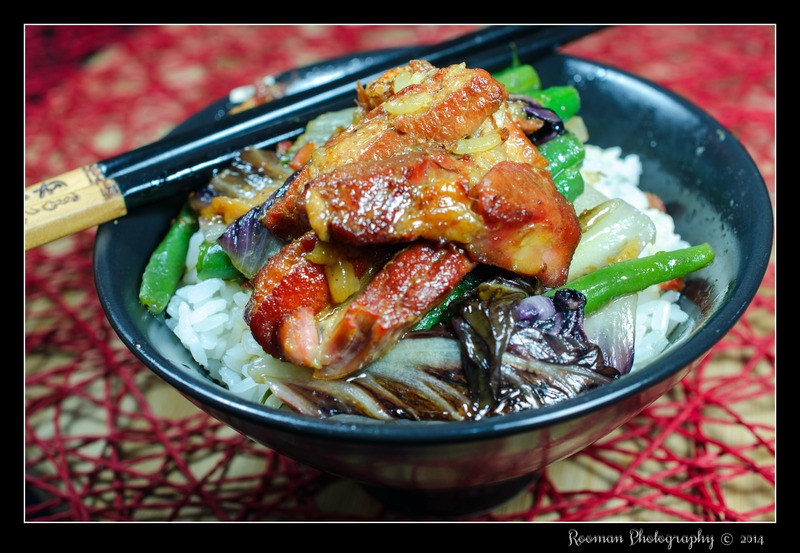 MRS ROO: Growing up having a father who worked as a Chinese cook and chef was a wonderful experience as I developed a high appreciation of good food at a very early age. Always trying something new, he inspires me to always be creative with food; its preparation, taste and presentation which all need to be in harmony with each other. Dad was always very hospitable towards any guests and there was always room for another plate at the table no matter how little we had. My maternal grandmother also lived with us while growing up and I was too young and ignorant to really appreciate her culinary knowledge, skills and traditions until after she passed away. My great love of baking first came about when my Dad bought an electric hand mixer circa 1975 (he still uses it) and some cake mix for me to use when I was around 10 years old. I’ve come a long way since then and still learning! What would you say is your biggest challenge when preparing food for family and friends? 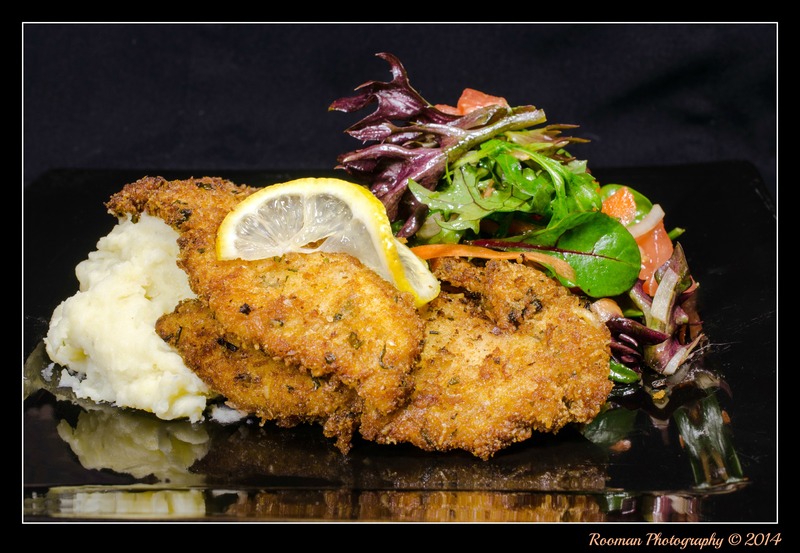 Endulge in this scrumptious Chicken Schnitzle! ROOMAN: My biggest challenge cooking for my wife and three kids would be trying to find something they all like but also something different. As a kid I grew up eating a lot of pasta which at the time I did not mind but I would hate for my kids to eat the same thing all the time without learning about other types of food and flavours. When cooking for extended family and friends again something what everyone likes but at the same time make it slightly different, but also make sure no one has any allergies. When I cook for my immediate family, I normally try to keep the cost between $20 and $25 per dish, so keeping this in mind when cooking for extended family, I try to keep within a certain budget without sacrificing too much. MRS ROO: Providing enough food to satisfy their huge appetites as it almost gone before it gets to the table and also catering to various food allergies and tastes within our family/friend circle. Do you have a current ingredient obsession? If it’s a secret ingredient, do tell. ROOMAN: My favourite ingredient is Garlic. I add Garlic to nearly everything I cook, I love the flavour it gives food and the smell as it opens your appetite. Also I like Garlic as it keeps the Vampires away! If I am making a pasta sauce I grate in a carrot as it gives the sauce a sweeter taste. Stir fries and fish sauce work great together as it lifts the taste of Asian cuisine, it really depends on what I am cooking though. MRS ROO: I have three separate ingredient obsessions really, that is garlic (our family loves garlic), and vanilla bean in baking /sweets and fish sauce as a quick dash can really lift the flavour of most dishes without overpowering. 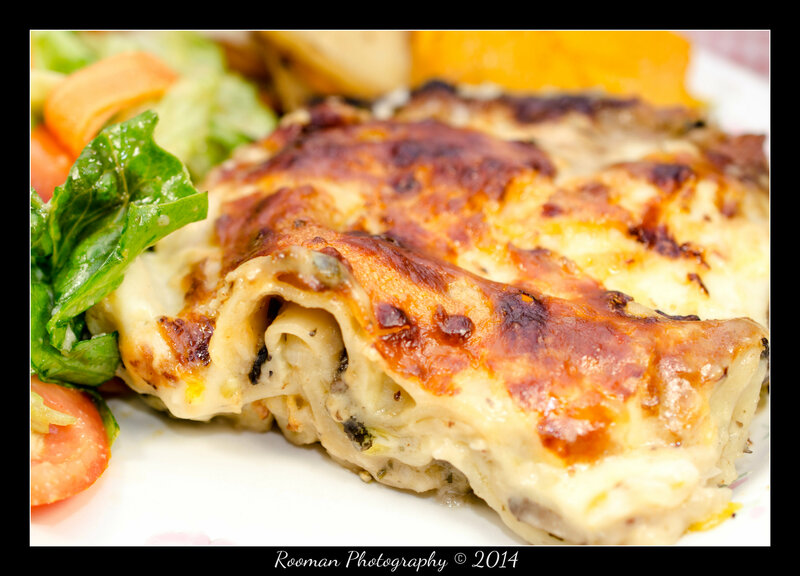 We’d love to have a fork to slice right into this lovely looking Lasagnae! What would you throw together from your pantry if you had only 10 minutes? ROOMAN: What I would throw together in 10 minutes from my pantry would depend on what I am in the mood for and if it is for me or the whole family. In the morning when we are in a hurry, I make the kids two minute noodle stir fry. Sometimes I get a can of tuna and add it to the left over steamed rice or a quick stir-fry with the rice. For my wife and I, boil up some pasta and then in a fry pan add a splash of Olive oil heat it up and add some garlic, anchovies and parsley and mix through the cooked pasta. MRS ROO: from what I see in the pantry at this moment, I would open a can of chick peas, tuna and toss through some lettuce, tomato, onion, fresh herbs and make a quick dressing with some extra virgin olive oil, honey, balsamic vinegar and crushed garlic and serve with olives, cheese and crusty bread. If you could travel to any city in the world just for dinner, where would you go and why? ROOMAN: I would love to visit Vietnam and taste all the fresh food they make and try new foods or go to China and try the vast variety of noodle dishes and watch them cook and smell the wonderful aromas. The best way to learn and taste food would be to go to the little towns and villages and embrace how they live and eat. MRS ROO: I would love to visit a little trattoria in San Marino to sample provincial food and wine, coffee and gelato alfresco style under the stars with the locals; it would be a dream come true! What is your guiltiest pleasure in the food world? ROOMAN: I love Peking Duck it is very greasy but oohhhh the taste! Just thinking about it now wants me to go out and buy one! The way the Chinese make it is amazing, I am lucky to have it twice a year. When I do have it (such heaven!) but later I get stomach-aches from the richness of the fat. The pain is worth it though. MRS ROO: I have so many guilty food pleasures it’s difficult to choose just one! A savoury dish would be Ginger Crab with noodles, absolutely finger-licking good and a sweet would be Sticky Date Pudding with Caramel Sauce and Double Cream mmmm, extremely wicked indeed! Definitely not to be eaten together though. What does food mean to you? 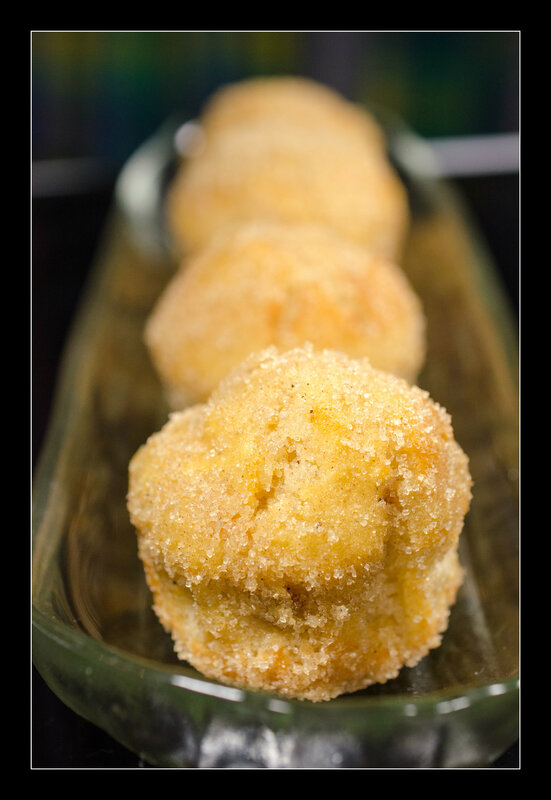 A cup of coffee matches these Doughnut Muffinsins real well! memories as we eat say a bowl of Pasta and we remember how as a kid mum or your Nona made food and we begin to remember the good times we had growing up. Food takes us on a journey through time, taste and emotions and the more love you put into your food the better the feelings you get. Mr. and Mrs. Roo Man, we thoroughly enjoyed spending this time with you. It is always great to get the opportunity to speak with extraordinary cooks like you. The Unknown Cook community will always be a fan of yours. We are surely keeping our eyes on your meals! Help The Unknown Cook’s endeavor of operating a mobile restaurant a reality. You can do so by donating below. We will appreciate your help tremendously. Posted on August 21, 2014, in Uncategorized and tagged 5 Spice Caramalised Pork, best beef recipes, Char Siu Stir Fry, chicken recipes, Chicken Schnitzle, cooking best chicken recipes, doughnut recipes, food, LasagnaeDoughnut Muffinsin, Peking duck, recipes, Roo Man, unknown chief, unknown cook. Bookmark the permalink. Leave a comment.